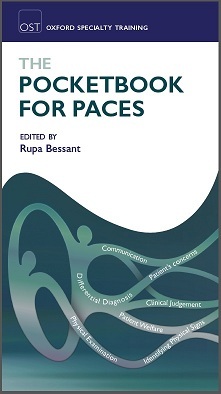 The Pocketbook for PACES aims to provide an easily portable yet comprehensive book, which includes all of the most relevant clinical information for the PACES examination. In addition it will form an excellent pocket reference book for trainees in acute medicine and clinicians involved in bedside teaching. Physicians approaching the PACES examination have already amassed a large amount of information whilst studying for the MRCP Part 1 and Part 2 written examinations. This book aims to consolidate candidates’ theoretical knowledge and help them to apply it effectively to the clinical scenarios most frequently encountered in the PACES and MRCPI Clinical examinations. Each section will deal with one of the PACES examination stations and will commence with a systematic approach to examining a particular organ system, taking a Clinical History or dealing with a Communication Skills scenario. This will be followed by detailed analysis of common clinical signs and scenarios. Candidates will be guided to personalise case discussions according to the age, gender and ethnicity of patients. ‘Top Tips’ and ‘Common pitfalls’ will be highlighted throughout. For each clinical scenario examples of potential viva questions and answers will be suggested, encouraging candidates to consider each case more in depth and develop an approach to the questions that they are most likely to be asked by the examiners prior to the examination. The Oxford Pocketbook will provide a structured approach for complex cases, which candidates may not have previously encountered, and will demystify some of the fears associated with the examination, giving the candidate confidence to convincingly demonstrate their true ability. I am delighted to provide a foreword for The Pocketbook for PACES. Medical professional training and clinical practice, in the UK and internationally, is changing rapidly. As such all clinically based medical examinations must keep abreast of these changes if we are to ensure the highest quality of care is provided for all patients. The MRCP(UK) PACES examination is internationally recognized and has evolved to ensure that clinical practice is assessed in a robust and reproducible manner wherever the candidate takes this examination. Candidates sitting this examination must be competent in all clinical scenarios and in the related clinical domains. This textbook is clearly written and provides candidates with a robust framework to support their preparation for this important clinical examination. No individual textbook will provide a candidate with all the information and advice to prepare for PACES but this book offers the potential candidate a strong foundation as they hone their clinical skills. I would like to personally recommend this pocketbook and wish all readers revising for PACES every success. It is a great honour and pleasure to write a foreword for The Pocketbook for PACES. Elegantly produced with a coherent structure followed consistently throughout the book, it is very clearly focused on the current format and content of the PACES examination, as well as having a chapter aimed at the MRCPI. I am impressed by the level of relevant detail concerning the conditions that commonly feature in the exam, as well as useful examination and presentation techniques. The sections on communication and history are full of helpful information, and provide a logical starting point in preparing for stations 2 and 4, for which I know many candidates find it challenging to revise. By reading the book, I have learned a lot about the modern management of conditions outside my own specialty, and even one or two new things about my own. The distinguished authors have clearly put a great deal of thought into their chapters, informed by long experience in teaching MRCP candidates. I am an admirer of PACES, believing that unlike many other medical examinations, it helps to make the candidate a better doctor. The examination marks a transition from the novice towards the expert diagnostician. As undergraduates, we are taught the time-honoured ritual of taking a full history, and examining every system in the hope of coming to the correct diagnosis. Experts do not work like this, but rather generate hypotheses as they interrogate the patient, and examine and investigate to rule out differentials to come to the correct diagnosis. Experts make the correct diagnosis more rapidly and with sparser information than novices. The PACES examination helps to assess whether candidates are starting to make this transition, while also assessing communication and professional skills. The examination helps to sort trainable young physicians from ‘book doctors’ who know 10 causes of renal tubular acidosis and the path of the seventh cranial nerve, but cannot suggest a sensible approach to help Mrs Jones with her painful erythema nodosum or peripheral oedema. The PACES examination, in essence, assesses whether candidates have mastered the skill of integrating years of theoretical learning with good history-taking and examination skills, to come up with an appropriate differential including the correct diagnosis for the patient in front of them, and communicate that effectively. I believe that the structure of The Pocketbook for PACES will help candidates in making this transition from novice to proto-expert, making them both more likely to pass the exam, and also better physicians.